In February of 2014, I volunteered as a team member of the Carleton University Alternative Spring Break program. I had the opportunity to travel to San Marcos La Laguna, a remote village in rural Guatemala and to assist with improving the existing infrastructure of the community and conduct basic health checks with the vulnerable population. We spent two days at a primary school in a neighbouring community called Solola, where we built walls enclosing the school from the outside community; these walls provided a safe space for the children to play uninterrupted during their school day. We built the walls in the primary school from eco-ladrillos (or eco-bricks), a task that entailed filling pop bottles with plastic littering the Solola community. The eco-ladrillos were encased in metal chicken wire and were covered in cement to create a stable wall. We spent another day in a kindergarten in San Marcos clearing away debris from fallen trees in the playground and sprucing up the classrooms. Our final volunteer day centered on the nutrition and healthcare theme, where we conducted a health check in a local elementary school and distributed Spanish reading materials that emphasized the benefits of eating healthy to kids. 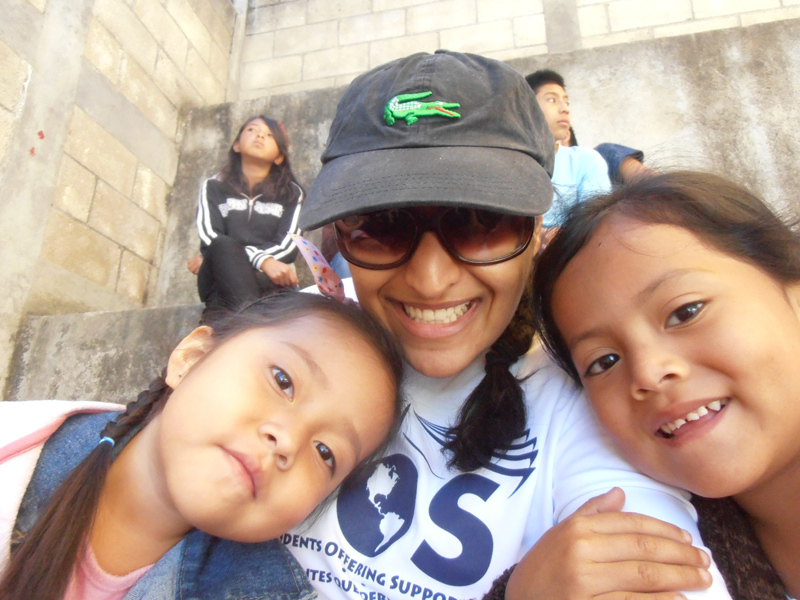 I had travelled extensively in the year preceding my volunteer work in Guatemala. My travels allow me to engage skill sets critical for the modern world but are rarely used in our day to day lives. I was further motivated to pursue another abroad experiences did well to reconnect me with my love of learning new languages and immersing myself in a culture completely different from my own. Finally, I found that pushing myself to a place outside my comfort zone allowed me to learn a great deal about myself and the type of environment I need to thrive. My goal was to find an experience abroad that would integrate volunteering in a Central American country while allowing me to work with fellow student volunteers. I got lucky while researching opportunities to volunteer abroad through my academic institution, and found the Student Experience Office (SEO)! The SEO at Carleton University offered everything I wanted and more in the Alternative Spring Break (ASB) program. The ASB program incorporated community service learning, a visionary idea where students are paired with a community organization in a mutually beneficial arrangement; students gain meaningful life experiences while completing work for a non-profit organization. I selected the ASB program as it understood the needs of the average student and provided timely and affordable abroad experiences for program participants. Needless to say, the program was incredible! Each school year, a number of pre-determined trips take place in the study break of the winter semester. Applications for the ASB programs are typically due in the fall semester of each year and all applicants are interviewed prior to being accepted into the program. Accepted participants are then divided among the various trips; participant preferences are considered in the process. Over the school year, ASB participants meet for pre-departure training where they listen to thought-provoking speakers, engage in team-building activities and take part in discussion groups. Each ASB trip has an associated cost, which includes housing and transportation. Trip costs can range from approximately $200 to $1900; however, participants have numerous opportunities to fundraise and procure donations through the program, which significantly reduces trip costs. I feel that my attitude towards my fellow students and my willingness to be engaged in our discussions and the community that we would be in was one of the elements that made me particularly successful. What was the biggest surprise about your volunteer experience abroad? San Marcos is a small village of about 2,000 people that borders Lake Atitlan, one of the largest freshwater lakes in the world. The community is also nestled among dense natural greenery and surrounded by a number of active volcanoes, as well as being located directly on top of an active volcano. Guatemala’s natural beauty and terrain was absolutely breathtaking from the outset. As someone who struggles with insect-related phobias, the biggest surprise to me was how easily we humans are able to overcome our fears and hesitations in the presence of new and challenging experiences. Did anything happen in your volunteer workplace that gave you particular insight into your host culture? On the last day of our stay in Guatemala, my team and I attended a Mayan New Year blessing ceremony. The ceremony was situated on the top of an active volcano in San Marcos and was performed by a ninth-generation spiritual guide. As the ceremony was being performed, I began to reflect on my week in Guatemala. I realized that the friendships I’d made and the way I’d become immersed in the local culture had truly been a once-in-a-lifetime opportunity. Being invited to partake in the extremely sacred Mayan ceremony further showed me the willingness of the local people to welcome newcomers into their community and to teach them about their culture and customs. I will carry those ideals of welcoming and inclusion forward with me throughout my life. How did you deal with the cultural divide during your volunteer experience? In addition to our community service activities during the daytime, our team had engaging group discussions each evening. These group sessions were effective in helping team members synthesize the importance of our daily service in the lives of the community and relate what we learned that day to our education and our lives. Our trip organizers also ensured that we had time to relax and enjoy Guatemalan culture during our stay. We visited Mayan museums, frequented the local merchants and of course, sampled delicious Guatemalan chocolate. The combination of discussing the impact of our community work and interacting with the locals helped to put everything into context and helped us to further understand the local culture. In addition, many team members were able to speak Spanish well and so the language barrier that overshadows many such experiences was diminished. Spanish-speaking team members acted as translators, and so we could converse with the locals and really begin to learn about their lives. Over the past few years, I have given careful consideration to my career pursuits. My volunteer work and abroad experiences definitively solidified for me that any future career I undertake must involve interacting with people. I need to be engaged in the stories of other humans, to learn about their problems and try to resolve them to the best of my ability. Prior to this, I’d expected to pursue a future in healthcare management but have realized that the emphasis on high-level decisions as opposed to working with individuals would not be the best option for me. As a result, I took a hard look at my experiences and my education and chose the best route for me. I hold dual bachelor degrees, a B.Sc. Honours in Biomedical Sciences from the University of Ottawa and a B.A. Honours in Psychology from Carleton University. I have a keen interest in physiology and human behavior, and thus, I chose to pursue a Doctorate of Medicine (M.D.) at McMaster University this fall. I feel that becoming a practicing physician intersects well with my academic interests, my personal goals, my personality needs and further provides me with significant opportunities to expand my career. Bushra is a great example of a student who has consistently made the most of her trips abroad (check out her previous entry here), using them as tools for self-reflection and self-assessment. Her story also highlights the important realizations that become possible when a student rises to the challenge of going abroad. Bushra’s time as a volunteer has clearly helped her to define her professional future clearly. Her decision to attend medical school also opens up further global career potential, since there is much demand for skilled international health care professionals. In order to land such a position in the future, Bushra may still want to plan a longer-term international health care experience, either interning or volunteering with a health-focused NGO in a third world country. This way, she’ll keep the international health care option open after her medical degree is finished. Having been abroad more than once, Bushra has developed specific international skills, and being able to explain those skills to international or domestic employers is crucial: Check out Understanding and Explaining Your Skills and About Your International Skills. The All NGOs is a good place to start researching potential international volunteer opportunities with North American organizations. Use the country filters to narrow your search. Read Health Careers Abroad to get a sense of what opportunities exist for health care professional with an interest in working internationally.